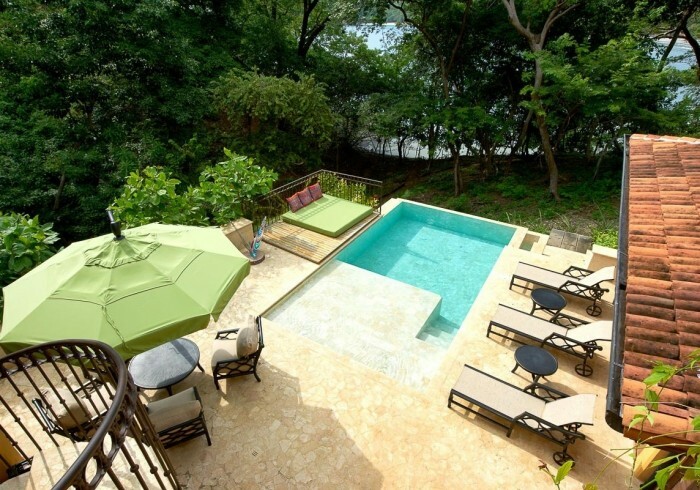 Casa Pelicano is a 7 bedroom 7.5 bathroom home located in Punta Penca. This beautiful and colorful home is decorated with antique pieces from Costa Rica . As soon as you enter the home you will be welcomed by a mural made by Julio Cesar Valverde with a colorful palette inspired by the ocean. On this level there is two bedrooms with queen beds each. On the main level you will find the kitchen and living room. The kitchen is fully equipped, next to the kitchen you will find a gas BBQ with a small fridge. The covered terrace showcases a beautiful round table for comfortable and relaxed seating. This terrace also offers additional seating arrangements with ocean views and immediate access to the swimming pool. The living room opens up to the kitchen, an adjacent indoor patio with fountain brings natural light into the room. The Master Bedroom strategically located in the heart of the home, it has a walk-in closet, a private bathroom with a skylight in the shower decorated with handmade tiles. The king bed overlooks the ocean and private terrace with a comfortable swing. The lower level of the home has a second Master bedroom with a king bed and doors that opens up to the infinity swimming pool. On this level you will find a second living room with an entertainment center. The kids’ bedroom is located next to this living room with two bunk beds and a queen bed. This bedroom opens up to a terrace with a table made from an original Surf Board of Robert August. If you follow the hanging bridge you will be able reach the Guest House with two bedrooms. the bedroom located on the main level has a king bed, a full kitchen with a private terrace. The swimming pool and terrace have outdoor sitting spaces as well sun loungers and a small deck overlooking the beach. If you walk down the trail you will reach Playa Danta just a few steps away!